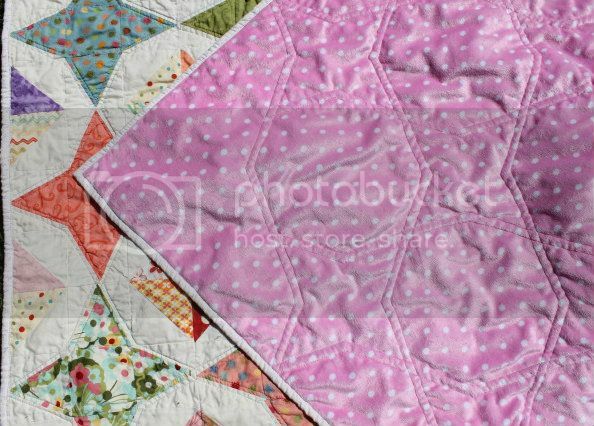 Katie Mae Quilts: Unnamed Baby Girl Quilt - Finished! Unnamed Baby Girl Quilt - Finished! Seriously, need a name for this one! 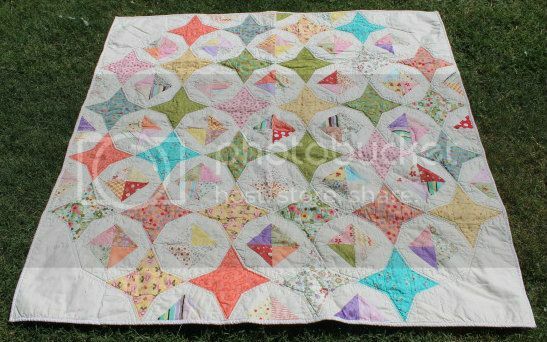 I started calling it the Triangle Circle Quilt...but while descriptive, that's boring. UBG reminds me of the BFG, at least. Which reminds me that I need to start reading Roald Dahl books to the Dude. He was vastly impressed with my Bunnicula books, so I think he'd like Dahl. UBG is made from Tri-Rec blocks, with HSTs in the corners instead of plain blocks. While I'm sure there's a similar pattern out there, I didn't use one. I quilted the inner and outer outline of the Tri-Rec blocks with variegated pastel thread. When I started laying it out, the green blocks "popped" a bit too much in random placement, so I circled them up in the middle. 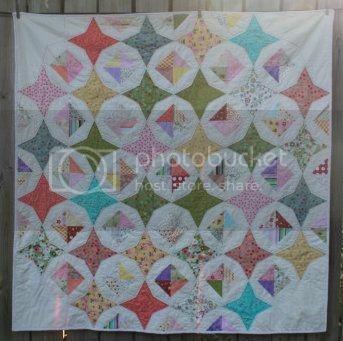 The backing is minky, and I love the way the quilting looks on it. It measures 54" square, and I'm not even going to try to name all the fabrics in it. There's everything from vintage sheets to Walmart scraps. And now I have to wait another couple of weeks to find out if I'm shipping UBG or Airplane Dreams! What an unusual and interesting pattern! Nicely done! 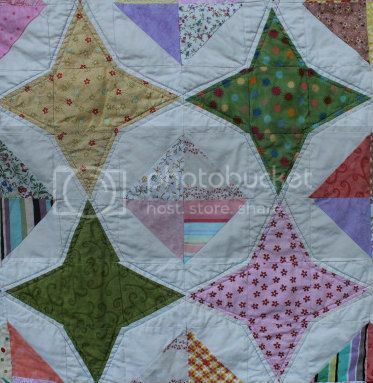 Very pretty quilt. Congrats on the finish. How about Dreamy Stars or Windows to the Stars for names. The first name echoes the name you gave the baby boy's quilt. I bought the ruler set and have never used it - your quilt is amazing. Such a pretty quilt. I like Kate's name suggestion Windows to the Stars. I have a hard time naming my quilts also. Love it! I See Stars! Very lovely quilt! I've never tried a Tri-Rec ruler. Looks like fun! Love the soft colors and know the minky back is soft and cuddly. Love the stars!! How about..."Starway to Heaven!." I have no good name suggestions but I think your quilt is beautiful! What a great quilt. Twinkle Twinkle, I see stars too. Wow, Kate, that is gorgeous! I love the design, and the colors are perfect! Whoop whoop!! Husband's Offensive T-Shirt Quilt - Finished!